Heat oven to 400°F. Prepare pie crust as directed on box for one-crust filled pie using Betty Crocker® stoneware pie pan. In 2-quart saucepan, mix pineapple juice, cherries, cornstarch, nutmeg and ginger. Cook over medium heat, stirring constantly, until mixture thickens and boils. Boil and stir 1 minute; remove from heat. Stir in pears. Spoon into pie crust-lined pan. In medium bowl, mix remaining ingredients with fork until crumbly; sprinkle over pear mixture. Cover edge of pie crust with 2- to 3-inch strip of aluminum foil to prevent excessive browning; remove foil during last 15 minutes of baking. Bake about 35 minutes or until crust and topping are golden brown. Cool on wire rack at least 1 hour before serving. 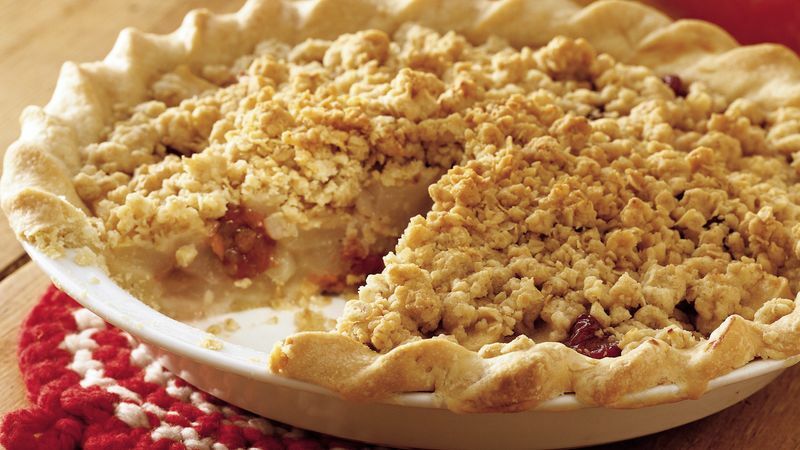 You can use dried cranberries or raisins instead of the cherries in this crumb-topped pie.